Måns Nilsson, Dave Griggs and Martin Visbeck present a simple way of rating relationships between the targets to highlight priorities for integrated policy. Next month in New York, the United Nations’ 2030 Agenda on Sustainable Development will have its first global progress review. Adopted by the UN General Assembly in 2015, the agenda represents a new coherent way of thinking about how issues as diverse as poverty, education and climate change fit together; it entwines economic, social and environmental targets in 17 Sustainable Development Goals (SDGs) as an ‘indivisible whole’. Implicit in the SDG logic is that the goals depend on each other — but no one has specified exactly how. International negotiations gloss over tricky trade-offs. Still, balancing interests and priorities is what policymakers do — and the need will surface when the goals are being implemented. If countries ignore the overlaps and simply start trying to tick off targets one by one, they risk perverse outcomes. For example, using coal to improve energy access (goal 7) in Asian nations, say, would accelerate climate change and acidify the oceans (undermining goals 13 and 14), as well as exacerbating other problems such as damage to health from air pollution (disrupting goal 3). If mutually reinforcing actions are taken and trade-offs minimized, the agenda will be able to deliver on its potential. For example, educational efforts for girls (goal 4) in southern Africa would enhance maternal health outcomes (part of goal 3), and contribute to poverty eradication (goal 1), gender equality (goal 5) and economic growth (goal 8) locally. The importance of such interactions is built into the SDGs: ‘policy coherence’ is one of the targets. The problem is that policymakers and planners operate in silos. Different ministries handle energy, agriculture and health. Policymakers also lack tools to identify which interactions are the most important to tackle, and evidence to show how particular interventions and policies help or hinder progress towards the goals. Many preconceptions that influence decisions are outdated or wrong, such as the belief that rising inequalities are necessary for economic growth, or that mitigating climate change is bad for productivity growth in the long term1. To make coherent policies and strategies, policymakers need a rubric for thinking systematically about the many interactions — beyond simply synergies and trade-offs — in order to quickly identify which groups could become their allies and which ones they will be negotiating with. And they need up-to-date empirical knowledge on how the goals and interventions of one sector affect another positively or negatively. As a first step, we propose a seven-point scale of SDG interactions (see ‘Goals scoring’) to organize evidence and support decision-making about national priorities. This should help policymakers and researchers to identify and test development pathways that minimize negative interactions and enhance positive ones. And it is globally applicable so that countries can compare and contrast, and learn from each other and over time. The influence of one Sustainable Development Goal or target on another can be summarized with this simple scale. +3 Indivisible Inextricably linked to the achievement of another goal. Ending all forms of discrimination against women and girls is indivisible from ensuring women’s full and effective participation and equal opportunities for leadership. +2 Reinforcing Aids the achievement of another goal. Providing access to electricity reinforces water-pumping and irrigation systems. Strengthening the capacity to adapt to climate-related hazards reduces losses caused by disasters. +1 Enabling Creates conditions that further another goal. Providing electricity access in rural homes enables education, because it makes it possible to do homework at night with electric lighting. 0 Consistent No significant positive or negative interactions. Ensuring education for all does not interact significantly with infrastructure development or conservation of ocean ecosystems. –1 Constraining Limits options on another goal. Improved water efficiency can constrain agricultural irrigation. Reducing climate change can constrain the options for energy access. –2 Counteracting Clashes with another goal. 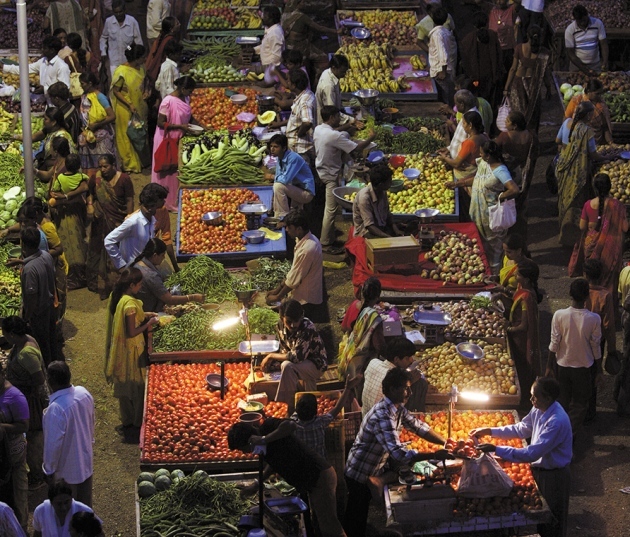 Boosting consumption for growth can counteract waste reduction and climate mitigation. –3 Cancelling Makes it impossible to reach another goal. Fully ensuring public transparency and democratic accountability cannot be combined with national-security goals. Full protection of natural reserves excludes public access for recreation. We rate seven possible types of interactions, from the most positive (scoring +3) to the most negative (−3). These can be applied at any level — among goals and targets, to individual policies or to actions (see ‘Worked example’). 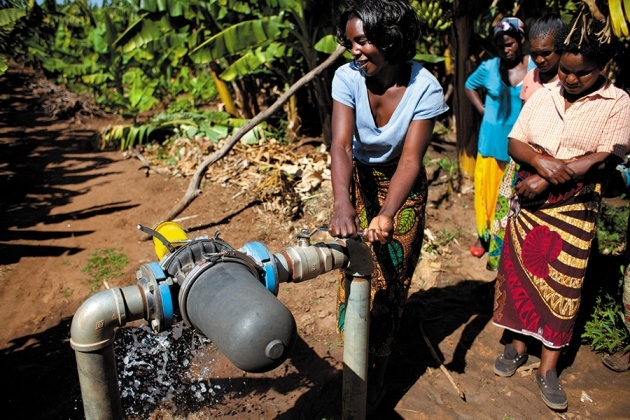 A hydropowered irrigation pump in use at the Kabwadu Women’s Banana Farm in Zambia. In sub-Saharan Africa, ending hunger (goal 2) interacts positively with several other goals — including poverty eradication (goal 1), health promotion (goal 3) and achieving quality education for all (goal 4). Addressing chronic malnourishment is ‘indivisible’ from addressing poverty — which gains the interaction a score of +3. Tackling malnourishment reinforces (+2) educational efforts because children can concentrate and perform better in school. Not addressing food security would counteract (−2) education, when the poorest children have to help provide food for the day. Food production interacts with climate-change mitigation (goal 13) in several ways, because agriculture represents 20–35% of total anthropogenic greenhouse-gas emissions4. Climate mitigation constrains (−1) some types of food production, in particular those related to meat (methane release from livestock constitutes nearly 40% of the global agricultural sector’s total emissions)5. Yet food production is reinforced (+2) by a stable climate. Securing food from fisheries is also reinforced by protecting the climate, because that limits ocean warming and acidification. Finally, in some parts of sub-Saharan Africa, promoting food production can also constrain (−1) renewable-energy production (goal 7) and terrestrial ecosystem protection (goal 15) by competing for water and land. Conversely, limited land availability constrains (−1) agricultural production. For practical policymaking, the process should start from a specific SDG — in line with a minister’s mandate — and map out, score and qualify interactions in relation to the other 16 goals and their targets. Positive interactions lend themselves to building strategies across sectors. The three negative types will be subject to trade-offs, and the target of extra regulations and policies, such as bans. But negative-scoring interactions might also attract public investment in technologies and solutions that over time might push the needle up the scale. There are four main considerations when applying the scale. First, is the interaction reversible or not? For example, failing on education (goal 4) could irreversibly damage social inclusion (goal 8). Loss of species owing to lack of action on climate change (goal 13) is another irreversible interaction. Conversely, converting land use from agriculture to bioenergy production (goal 7) might counteract food security (goal 2) and poverty reduction (goal 1) but could be reversed. Second, does the interaction go in both directions? For instance, providing energy to people’s homes benefits education, but improving education does not directly provide energy. A third consideration is the strength of the interaction: does an action on one goal have a large or small impact on another? Negative interactions can be tolerable if they are weak, such as the constraints that land resources might put on the development of transport infrastructure. Fourth, how certain or uncertain is the interaction: is there evidence that it will definitely happen or is it only possible? Countries must interpret the SDGs according to their national circumstances and levels of development, so interaction scores will vary. Differences in geography, governance and technology make it dangerous to rely on generalized knowledge. The regional resource base makes a big difference. For instance, bioenergy production is widely assumed to counteract food security through land competition. But in the Nordic region, bioenergy markets have reinforced the agricultural and forest production systems — offering new and more diversified market opportunities and increasing farmers’ and forest owners’ resilience2. Introducing technologies can render interactions more positive. For example, a transition to electric cars, fuelled by low-carbon power, could make personal-car-based mobility more consistent with climate-change goals. Negative interactions may be the result of weakness in institutions, legal rights or governance procedures, which marginalize vulnerable groups. For example, poorly governed industrialization and infrastructure development (goal 9) in emerging economies or agricultural productivity efforts (goal 2) can counteract local livelihoods and increase inequalities (working against goal 10). Timescale matters: intensifying food production to end hunger in places where resources are scarce may be feasible in the short term, but over time can deplete fisheries and forests. And spatial scale matters, too: for instance, industrial development may cause pollution and adversely affect the local environment and people’s health, but may also generate wealth that can support national health infrastructure. Politicians might mandate that health plans directly benefit the local community. This conceptual framework is a starting point for building an evidence base to characterize the goal interactions in specific local, national or regional contexts. There is no formal platform for sharing such knowledge yet, but the International Council for Science (ICSU) is beginning to use the framework and populate it with empirical evidence3. The ICSU is bringing together research teams of leading experts from universities and institutes around the world to develop thematic case studies, starting with the SDGs for health, energy and food. Each team will define the expertise needed to characterize and quantify the domain’s interactions with all other SDGs, organize existing knowledge about these interactions, and identify key gaps and priorities. Many knowledge gaps will surface. For example, the relationship between urban developments and human health and well-being is only beginning to be studied. Filling the gaps will be costly and will require contributions from research councils and funders such as the European Union’s Horizon 2020 framework, as well as governments and universities. The UN should consider how best to track interactions in its SDG monitoring systems, which is now being designed. Tracking interactions will be more complicated than monitoring single sectors, but it could be done in detail in a few key places, such as for the nine SDG pilot countries, which include Uganda and Vietnam. This interactions framework is intuitive, relatively easy to use and broadly replicable. It will facilitate the accumulation of knowledge and policy learning across countries. To further ensure that the research meets governments’ needs, the ICSU and other knowledge brokers such as the Organisation for Economic Co-operation and Development and the UN should convene a series of dialogues and workshops around interactions and how to apply them to policymaking. A first opportunity to put SDG interactions on the agenda is at next month’s high-level political forum, where 22 countries, including Germany and Colombia, will report back on their early action plans.